Sometimes, it pays to just relax and take a look at your surroundings and realize that there are good people everywhere, to such a degree that you’re brought to tears to realize the overwhelming force that is good in the world. News organizations don’t talk about it, but sometimes you see something so moving that it can’t help but make its way into your daily news feed. That’s where this amazing video of Miranda Lambert comes in. 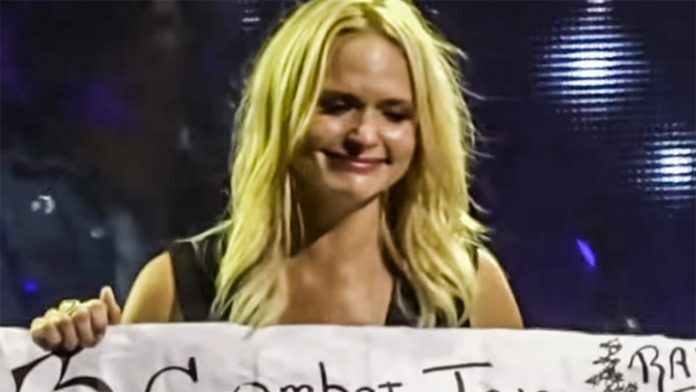 At a concert in Hartford, Connecticut, she’s given a fan-made sign that made her come to tears almost immediately. It was from a three-tour veteran that listened to her music every night to get through the hardest parts of his deployment. It struck a nerve, as she showed the audience the sign, then started a song before wiping away tears, visibly shaken by the soldier’s kind gesture. It’s a shining beacon of hope in a society that is all but lost from political correctness, divisiveness, and selfish thinking. I’m proud to be a part of a culture that values the sacrifice of our soldiers, and I applaud Miranda for doing the same.